A Hundred Tiny Hands translates cutting-edge university laboratory technologies into affordable educational toys that inspire children to "play science". Not just a toy, but also an online platform that gives young inventors the ability to share their discoveries, collaborate with each other, and interact with the scientific community. The U.S. needs inventive solutions for the immenent problems of the future. However, the U.S. is currently ranked 52nd in STEM education and only 33% of students recieving their Ph.D.'s in the U.S. are U.S. citizens. The low retention rate of student interest in STEM at the K-12 level has been identified as one of the underlying problems associated with these alarming statistics. We are a team of engineering graduate students who are frustrated with these statistics and have come up with an inventive solution for change. We translate the cutting-edge technology developed in our university laboratory to encourage children to explore the world and solve problems while learning fundamental STEM topics. Our storybook-inspired curriculum, hands-on approach, and online science community allows children to become real scientists. PhD Candidate in Biomedical Engineering at UC Irvine, and Co-founder of A Hundred Tiny Hands. 1. 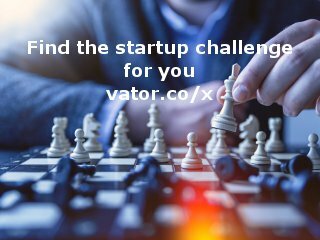 “Innovation comes out of frustration” – What is the problem and your personal struggle? Creative solutions from the future generations are required to solve imminent societal problems such as global warming, energy crisis, aging populations, and world hunger. There is an undeniable need to foster ‘home-grown' innovators in the technical fields to address these far-reaching societal problems. However, the United States is currently ranked 52nd in Science Technology Engineering and Mathematic (STEM) education. Additionally, the number of Americans pursuing post-secondary education in STEM fields is declining, and now over 67% of engineers receiving Ph.D.’s from US universities are not US citizens. According to the United States Department of Education “Only 16 percent of American high school seniors are proficient in mathematics and interested in a STEM career.” The low retention rate of student interest in STEM at the kindergarten to 12th grade (K-12) level has been identified as one of the underlying problems associated with these alarming statistics. The current methodology of teaching, along with the steep learning curve of certain STEM topics, has deterred many students, especially at a young age, from pursuing a career in STEM. In particular, current methodologies fail to engage girls in the STEM fields. Notably, while females comprise over 60% of all bachelor’s degrees, they comprise less than 19% of bachelor’s degrees in engineering. According to the U.S. Department of Commerce, the proportion in the workforce is even worse, where female engineers account for only 14% of the total. A Hundred Tiny Hands was started by a group of engineering graduate students who were frustrated that their outreach efforts to change these statistics could only reach so far. While we enjoy encouraging children’s passion for science by volunteer tutoring, hosting science camps, and laboratory tours, we are challenged with the reality that our limited manpower and time constraints prevent us from reaching as many children as we would like. We created A Hundred Tiny Hands to not only give children the tools they need to become inventors, but also to give them access to the scientific community and the opportunity to collaborate their ideas. The vision of A Hundred Tiny Hands is to transform the way children are brought up in science. "... Leadership tomorrow depends on how we educate our students today—especially in science, technology, engineering and math." 2. What age are you targeting and how are you getting this product out. A Hundred Tiny Hands offers take the latest discoveries in science and current engineering methodologies to create educational toys. These toys are nicknamed “Inventor Toolboxes” to emphasize the creative focus of the product, and the idea that kids will invent their own, individualized models of the product. Our initial three toolboxes, “SuperVision”, “Superhydrotension”, and “Polytrolpolis” have been targeted toward children between the ages of 6 and 12, ranging from elementary to middle school age. The simple design of these “Inventor Toolboxes” makes even the most cutting edge scientific technologies easy enough for any child or parent to learn. 3. How are you producing these? And what are you selling at? We are initially offering three unique “inventor toolboxes”. These toolboxes are packed with various kid-friendly apparatuses that we have obtained by employing the services of multiple suppliers. These toolboxes also include a fully illustrated comic book that our team of scientists has written ourselves. Our packaging partners have helped to create an exciting out-of-the-box experience for our product and Amazon delivery services are used to deliver our online orders. The initial price of each kit is $50, including shipping. 4. Why will kids buy it? What are alternative solutions and is this a price point that will be so compelling they’ll buy it? Is it comparable to science kits out there? 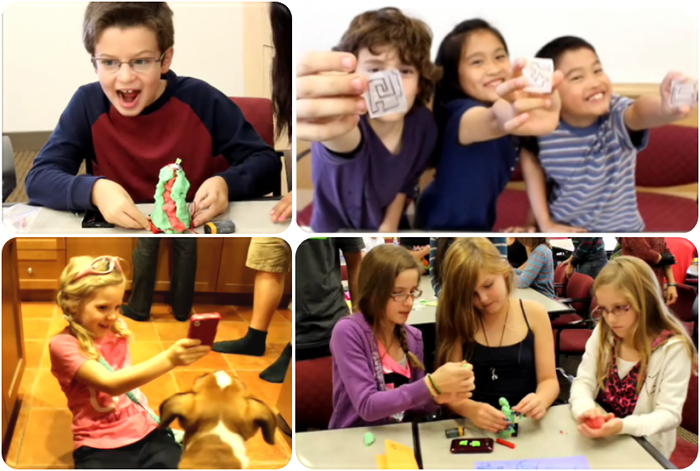 Our product is unique because we translate real cutting edge technologies developed in our nanotechnology lab so that kids can experience modern science topics in an engaging, interactive way! With each Inventor’s Toolbox, children are exposed to STEM exploration activities and games at a young age in an interactive, social setting such that they have incentives to stay engaged. They get to experience science the way real scientists do! A more creative component: Unlike their mainstream counterparts, educational toys traditionally lacked color schemes and sleek designs that attract kids’ attention. Science and art are not mutually exclusive. A Hundred Tiny Hands recognizes that the ability of mainstream toys to allow kids to express themselves artistically and creatively should be applied to scientific toys. Relatable characters, stories, colorful designs are some of the characteristics of our toolboxes. A social network: One of the redeeming qualities of being a scientist is the ability to sharing your discoveries with a much larger scientific community. Children are inherently creative and when given the right tools, this creativity can be channeled into real innovations. 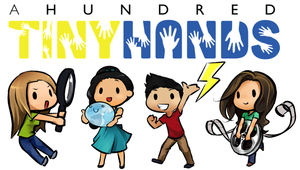 A Hundred Tiny Hands gives children the online platform to then share their innovations with their peers and also with the scientific community. Marketed towards boys and girls: A Hundred Tiny Hands’ toolboxes avoid playing to stereotypes and encourages am image of engineering and science that is not gender exclusive. Infinite playability: Current toys have limited modes of play or functionality. After a few usages, the novelty factor wears off and the action of playing becomes repetitive. A Hundred Tiny Hands toolboxes are only limited by the child’s imagination. 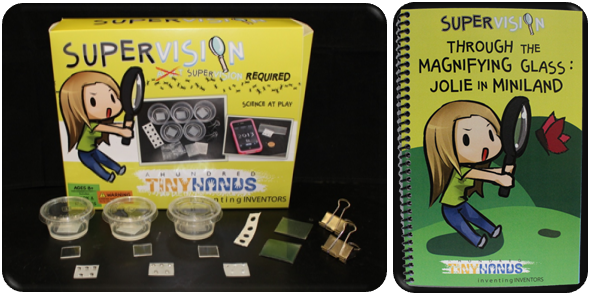 Exploration and discovery component: Current toys only focus on teaching science concepts. They do not allow children to truly explore and discover like real scientists. The true appeal of pursuing a STEM-related career is the constant pursuit of the unexplored. Affordable Price Point: Our price point is currently competitive with products of similar nature, sold by LeapFrog, Lego, National Geographic Store, and littleBits. 5. Can you get this on the shelves at Walmart or Amazon? Yes! We currently market and sell our products online on our own website, with Amazon delivery services. As our sales continue to increase, we plan to shift our distribution to shelves of standard retailer stores, such as Walmart. 6. How are you funding this? 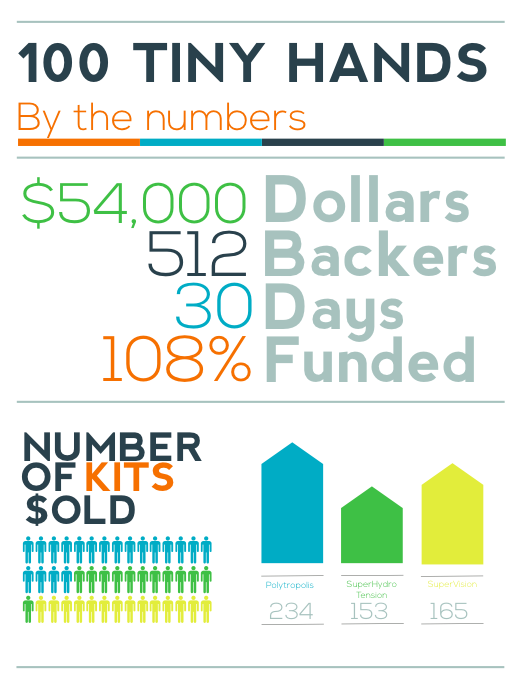 In February 2014 we launched a Kickstarter campaign to fund our first production run of the kits. We raised $54,000 in 30 days with 512 total backers. This campaign allowed us to fulfill pre-orders and stimulate company growth. We are now in the process of raising additional funding in preparation to spin out of the University of California, Irvine into a for-profit company. 7. How big is the market? The entire toy industry was valued at $84.1 billion worldwide as of 2012. Since 2009, the growth of the market has remained relatively stagnant. The toy industry is further broken down into 11 categories with Outdoor & Sports Toys and Infant Pre-school being the largest ($4.33 billion and $3.8 billion respectively). The ‘educational toy market’ falls under the All Other Toys category and is currently estimated to be at $3-5 billion worldwide. Although the ‘educational toy market’ has traditionally been viewed as a niche subsection of the toy industry, opinions of this specific market have begun to change as investors and companies have begun to realize the growing potential of the market. As part of the growth of the ‘educational toy market’, the sales of Science Technology Engineering and Mathematics (STEM) related toys have been increasing at a rate that far outpaces the industry standards. In 2010, an estimated $250 million in the United States STEM toy sales was generated, a 15% increase over the same timeframe from the previous year. Incredibly, despite the recession, the education industry has managed to expand over the past five years. During this time, revenue has grown 4.6% annually to an evaluation of $15.5B, with educational testing services taking the main chunk of the revenue, as shown in the figure below. The robustness and resilience of this market despite the economic downturn has been mainly due to the No Child Left Behind Act of 2001. Moreover, the impetus to create educational toys is already being reflected in the toy industry. Although sales in the overall toy industry have remained stagnant, the sales of STEM-related toys continue to increase.